Notes I’m a longtime fan of the Brothers Quay’s work, from their short films to this, their first feature and its successor, The Piano Tuner of Earthquakes. Institute Benjamenta stars the luminous Alice Krige as the tragic heroine Lisa Benjamenta and Mark Rylance as the puzzled, mischievous Jakob Von Gunten, eponymous hero of Robert Walser’s novel. The film is as much a dream-like reflection on Walser as it is an interpretation of his novel about a school for servants. This CD is sadly long out of print, but the crepuscular music, one of my favourite soundtracks, may be found online by the determined searcher. 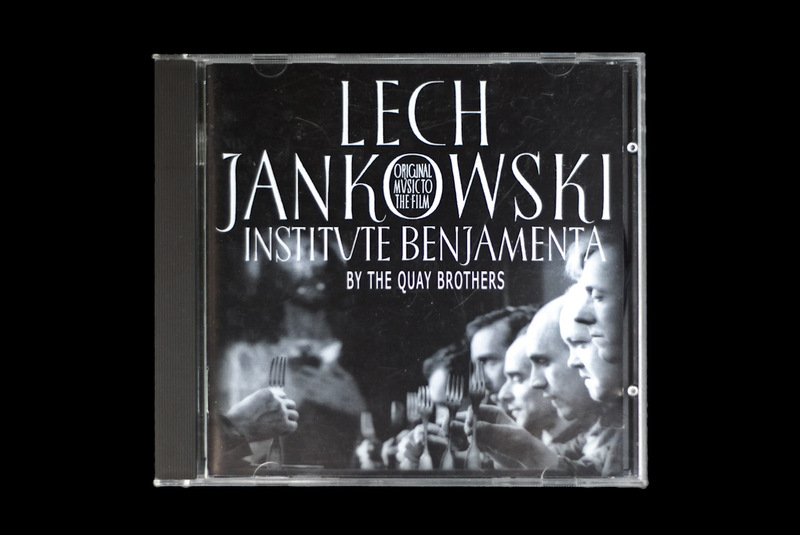 Although Jankowski was a favoured collaborator, something seems to have gone badly wrong as none of his music was used for The Piano Tuner of Earthquakes, the library music for Chris Marker’s La Jetée being substituted instead. 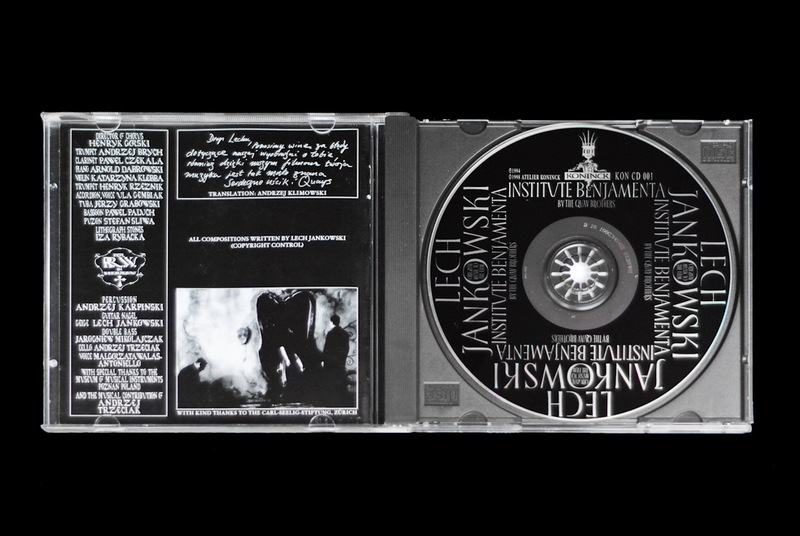 The design of this CD is a typographic joy, unafraid to cram text and image together in the confined spaces allowed by the jewel-case. Informed by Polish culture and the films of Jan Svankmajer, the Quay’s abstraction, deep sense of light and fascination for microscopic movement transcend their influences to produce a timeless, haunted narrative. After years of being very hard to find, the film has just been re-released as a joint Blu-Ray/DVD by the BFI and is hugely recommended. Thank you for this review. 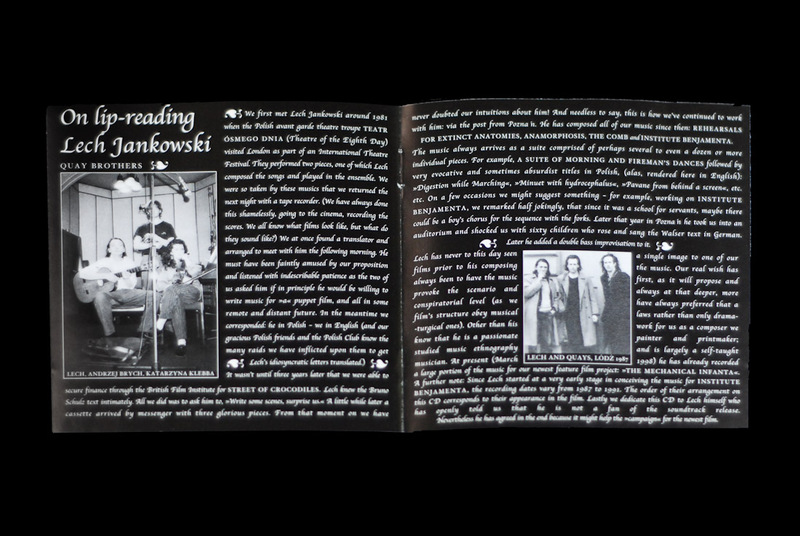 You might be interested to know that some copies should be available in NYC at the MOMA shop during the forthcoming exhibition of the work of the Brothers Quay. So not completely out of print – in fact the reality was that retailers were just not interested in stocking it. 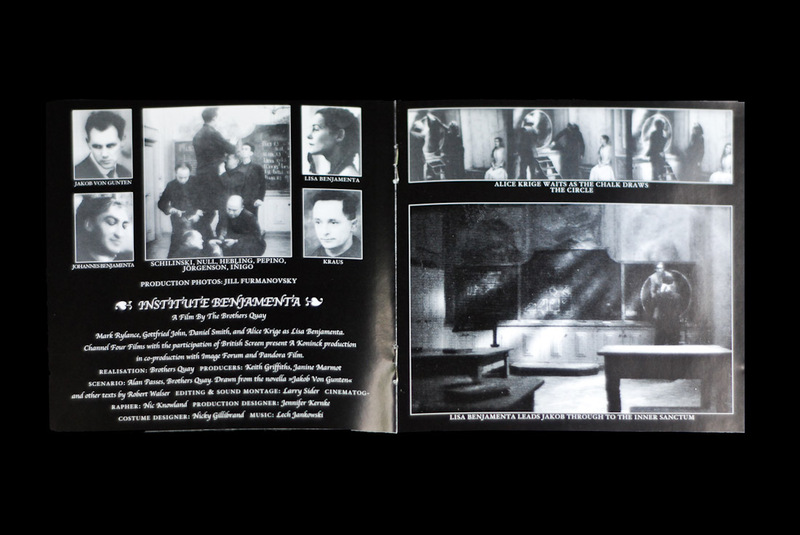 Thanks Keith, I found it incredibly hard to get hold of this CD, to the extent of it taking years. When a copy came up on discogs.com I jumped at it. That’s an exhibition I’d like to see. 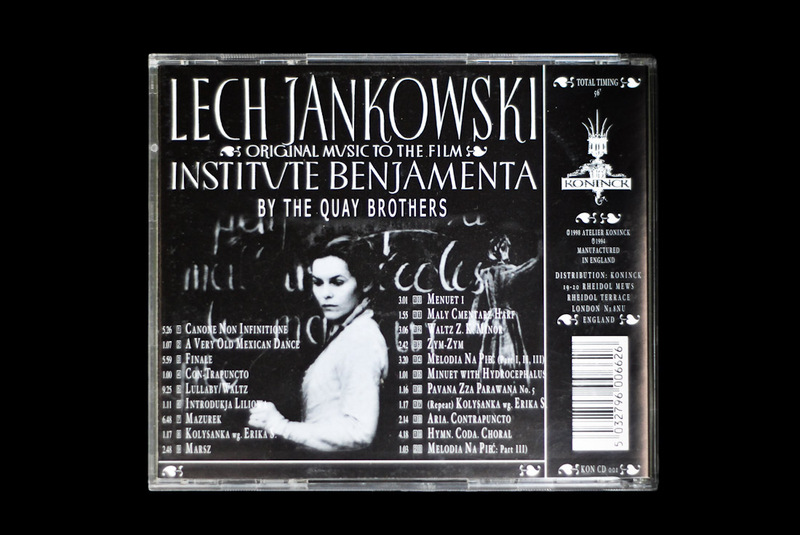 I’ve long been tempted by the only other extant release by Lech Jankowski covering soundtracks for some of the Quays’ short films “pause in shadow – street of crocodiles 49/5” . It’s for sale on the composer’s website, but I can’t quite bring myself to spend €28.50 on one cd. Well you should have written to me, much quicker, on info@illuminationsfilms.co.uk And, indeed other followers can order the CD direct from me for £10 + P&P. It will be on sale at the Moma NYC bookshop in August for $15, I think. Can’t help with other soundtracks yet I fear. Thank you for your interest & research. 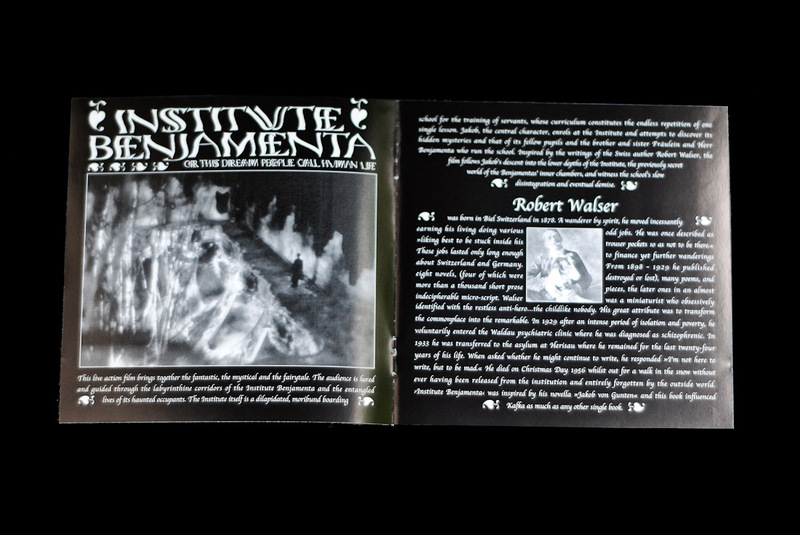 I’m been searching for this CD for a while – Keith, if you’re still around do you have any copies left for sale?